WTF Are You Reading? 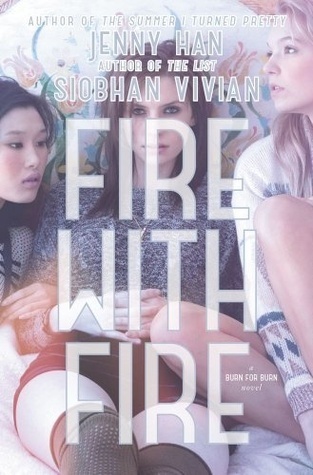 : The Flames of Revenge Still Burn Bright in "Fire With Fire"
The Flames of Revenge Still Burn Bright in "Fire With Fire"
When sweet revenge turns sour… Book two of a trilogy fromNew York Times, bestselling author Jenny Han and Siobhan Vivian. Just when you thought that secrets couldn't get any more explosive, the knives used for back-stabbing couldn't get any sharper, and the consequences for either side couldn't possibly get any more dire; the authors that brought you the sleeper YA sensation "Burn For Burn" are back with the scorching follow up, "Fire With Fire". This is the book that gives readers more detailed glances into the lives and histories of Kat and Lillia. This is also the read in which the girls form true bonds of friendship, and a great number of their protective barriers are allowed to drop. Things literally heat up for Mary, as she comes into her power. If you thought that all that he went through in the last book was bad; you haven't seen anything yet! They went after his body the first time around. This time, it's all about his heart. As our three artful Arachnida carefully craft their winding webs, they would be wise to remember. A web's creator can easily become it's first prisoner. Can Lillia break Reeve's heart without losing her own? What is the dark power that threatens to destroy Mary...and can she control it before it's too late? Can Kat overcome her past to find her future?